The Birds are not long back from the UK, where they once again took part in the Wetherspoons Real Ale Festival. They were one of two Aussie representatives in the UK this year, Young Henrys being the other, creating a real ale version of their Sunset Ale at Everards, following the success they enjoyed with a real ale version of their Golden Ale last year. 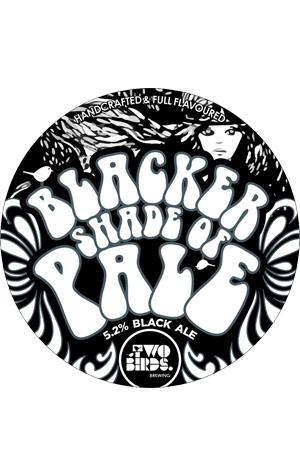 Before heading over, they sent a locally brewed limited release out to Aussie venues called Blacker Shade of Pale. As the name suggests, it's a little bit like a pale ale but darker. Or to use the Birds' own words: "It's not a Porter, or a Stout, or an IPA. It’s kinda like a Pale Ale, but blacker." Among the malts used is Midnight Wheat, which has been used in a number of beers in which brewers want darkness without much in the way of associated dark malt flavours, alongside fruity hops Simcoe, Cascade and Topaz hops. The result, we're told is a beer "brimming with orange, pine, roast and aniseed notes."